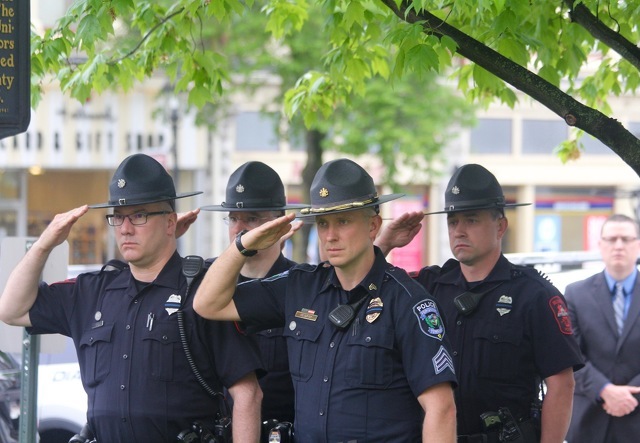 Officers from Centre County police departments stand at attention during the 20th Law Enforcement Memorial. Photo by Geoff Rushton/StateCollege.com. 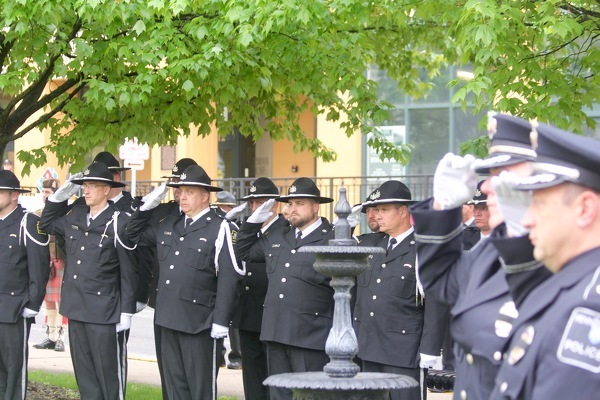 Members of Centre County law enforcement agencies and the local community gathered Wednesday outside of the Centre County Courthouse to remember lives of the 128 officers nationwide who died in the line of duty in 2017 and to honor the sacrifices made by police everyday. 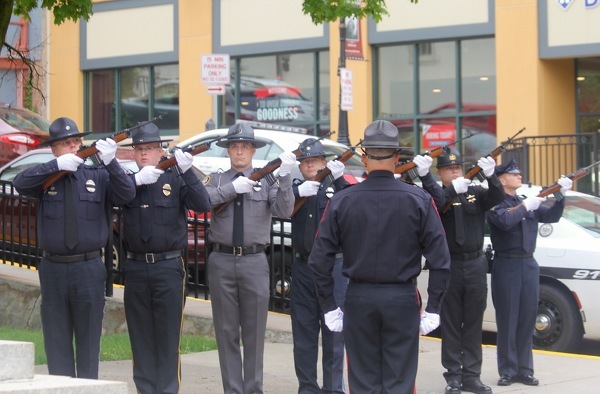 The 20th annual Centre County Law Enforcement Memorial was held as part of National Police Week, which was first declared nationally by President John F. Kennedy in 1962. 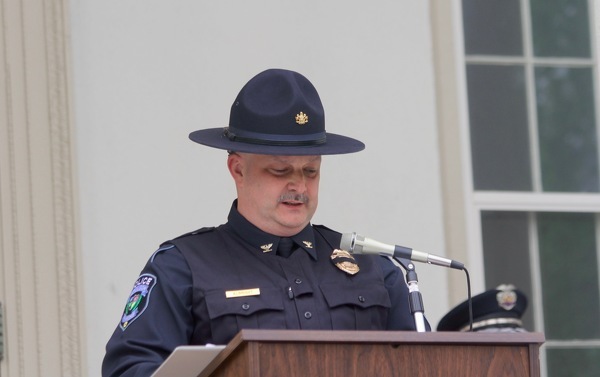 Penn State Police Chief Keith Morris said during his opening remarks that there is no shortage of reminders of the dangers law enforcement face, noting that since 1791, 21,542 officers have been killed in the line of duty in the United States. The most recent of those came on Tuesday, when a Jacksonville, Fla. sheriff's deputy was killed in a vehicle accident while responding to another crash. 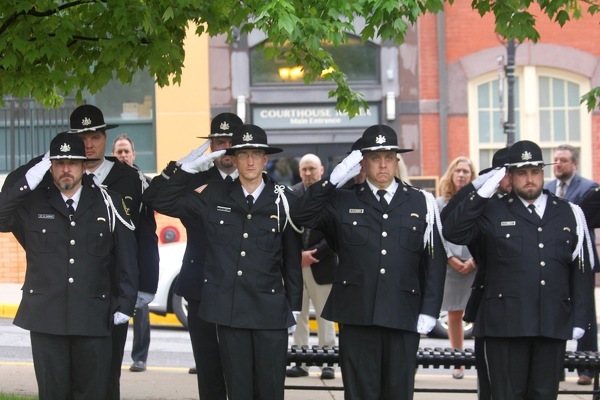 Of those line of duty deaths, 975 have occurred in Pennsylvania, including one just blocks away from the courthouse where Bellefonte Officer Ronald Seymore was shot and killed in 1971. "The statistics are sobering, a sobering reminder of the prices we face as law enforcement officer," Morris said. "It is right to commemorate the dedicated law enforcement officers who have served our communities. 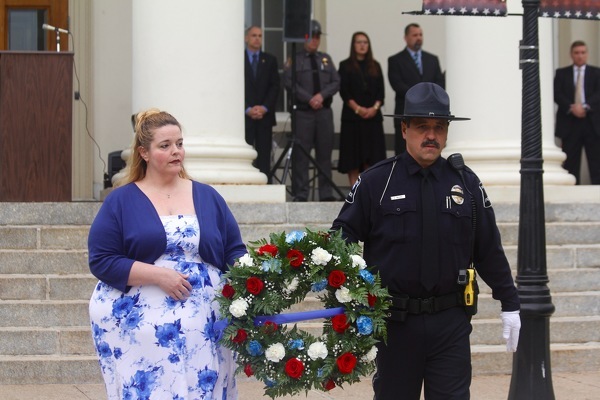 It is especially right to honor those who have patrolled our streets before us, especially those that made the ultimate sacrifice and lost their lives in the line of duty for the safety and protection of others. Today we remember them all." In 2018, line of duty deaths by gunfire are up 56 percent and total line of duty deaths are up by 4 percent over the same time last year, Morris said. 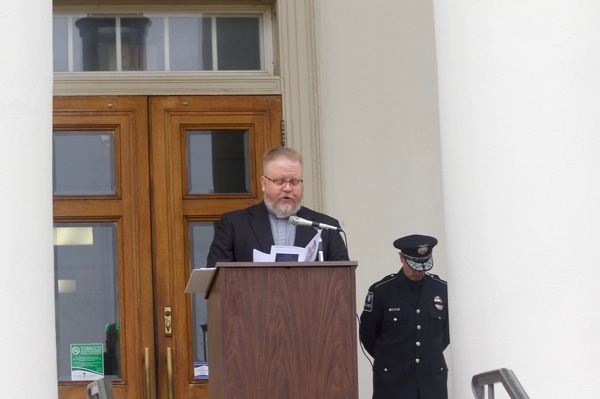 Following an opening prayer by Pastor Wiliam Osman of St. John Lutheran Church and the singing of the national anthem by Meg Brower, District Attorney Bernie Cantorna delivered keynote remarks. 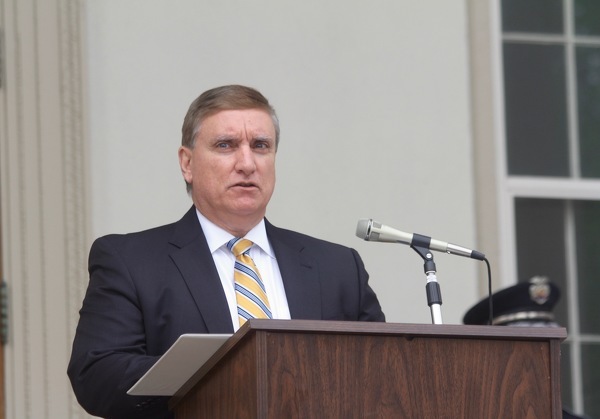 "We live in a beautiful place that is free from many of the challenges that other areas in the Commonwealth and our country suffer from," Cantorna said. "It is because of the devoted, selfless, professional work of our Centre County law enforcement." 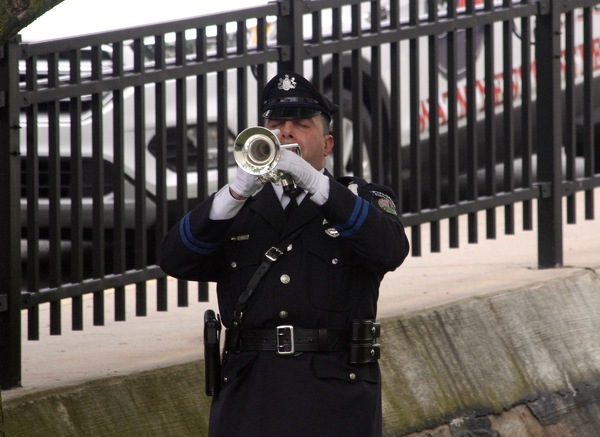 Cantorna recognized the three Pennsylvania officers who died in late 2016 and in 2017 -- Trooper Landon Weaver, New Kensington Police Officer Ryan Shaw, and Trooper Michael Stewart. He also remembered the three officers who have died so far in 2018 -- York Police Officer Alex Sable, New Castle Police Det. Brian Cuscino and Deputy U.S. Marshal Christopher Hill. 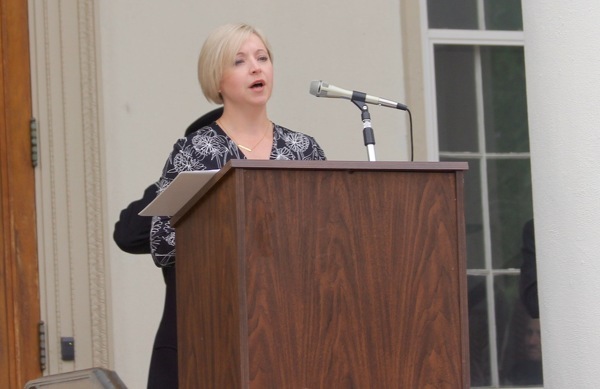 "Your job is one of the most difficult jobs in public service that exists," Cantorna said. "You're called to answer the call at the most troubling times and you do it everyday, without a second thought and with your own lives on the line. For that we humbly and graciously thank you." 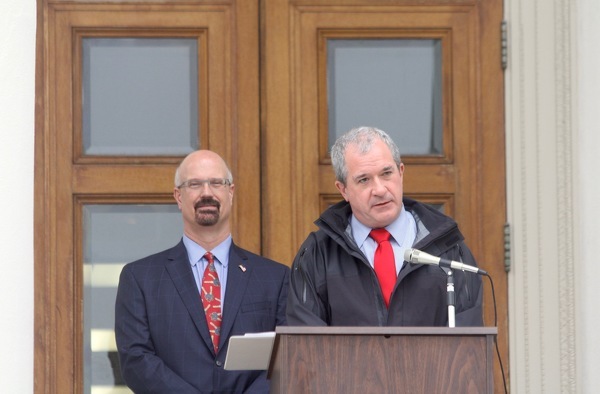 Centre County Commissioners Steve Dershem and Mark Higgins presented a proclamation declaring Peace Officers Memorial Day and Police Week in Centre County, while also offering their support for law enforcement. 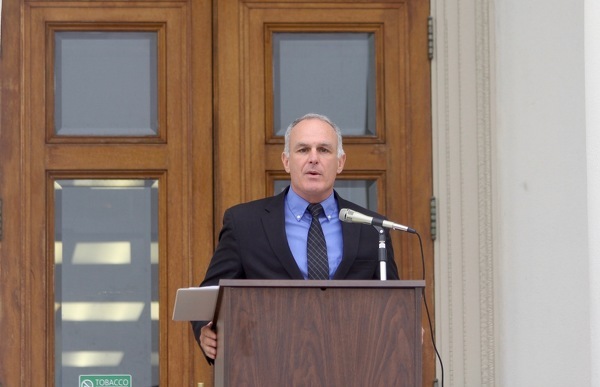 Dershem said that in addition to police departments, it's important to remember other law enforcement agencies who serve Centre County as well, including sheriff's deputies, corrections and probations officers, state and federal agencies, and prosecutors and judges. 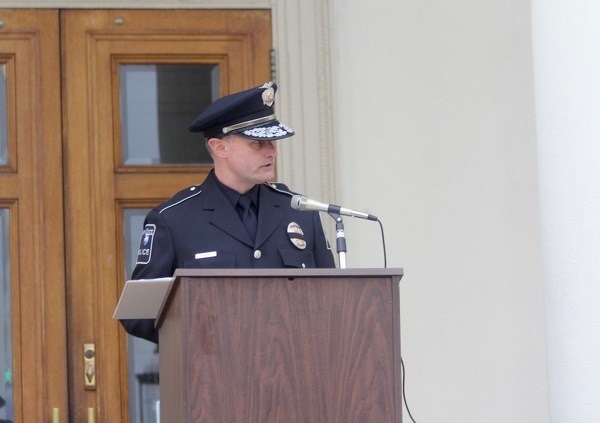 The names of all 128 officers killed in the line of duty last year were read by local law enforcement officials, followed by the presentation of the F.O.P. memorial wreath. 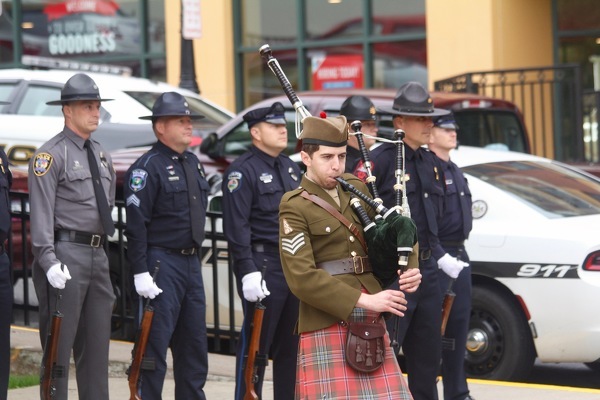 Bagpiper David Samson performed "Amazing Grace" and State College Police Officer Nick Raia played "Taps" after 21-gun salute by the Centre County Law Enforcement Rifle Team. 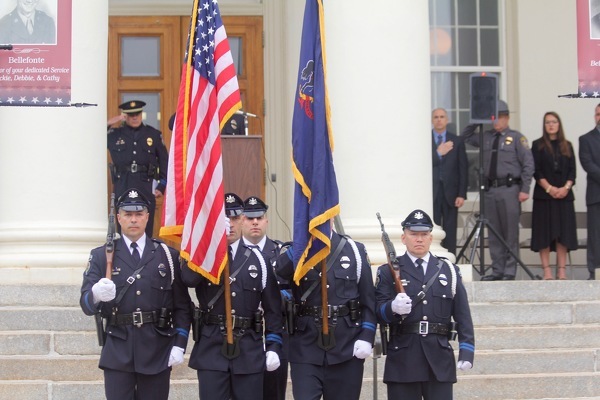 Members of the State College Police Department advanced and retired the colors. "For those of you standing here before me this week is also about you," Morris said. 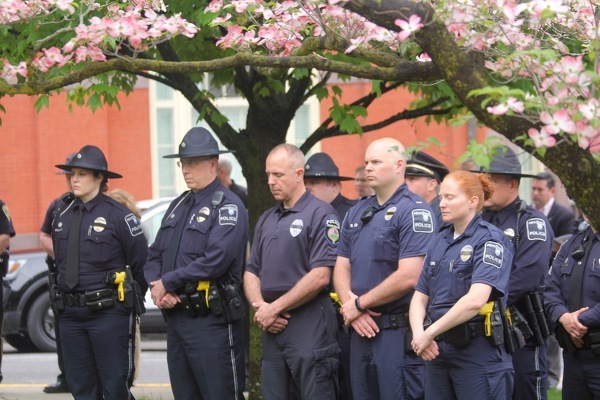 "We recognize your acts of bravery, courage and selflessness, putting the safety of the citizens of Centre County first and foremost without a second thought, many times leaving behind your own families to do so. I implore you to keep doing what you do, upholding the honor of that badge on your chest, an honor that transcends generations." See photos from the memorial in the gallery below. It doesn't get much more entertaining than this as Penn State will travel to face Pitt for a night showdown in Pittsburgh on Sept. 8. The Keystone Classic will air on ABC according to the network. The Nittany Lions face Pitt for the third game of the four-game series. 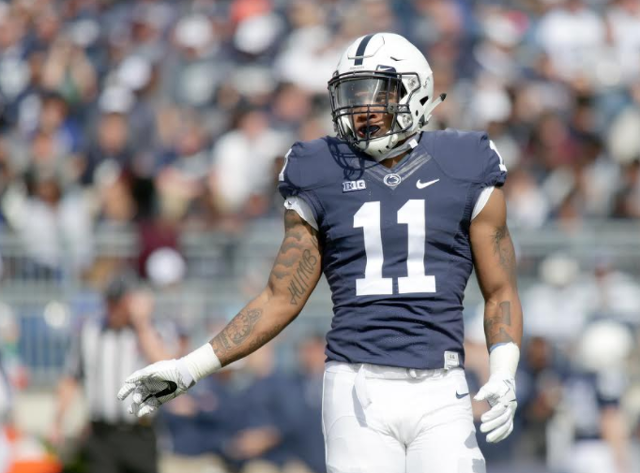 Penn State is 51-43-4 all-time against the Panthers.